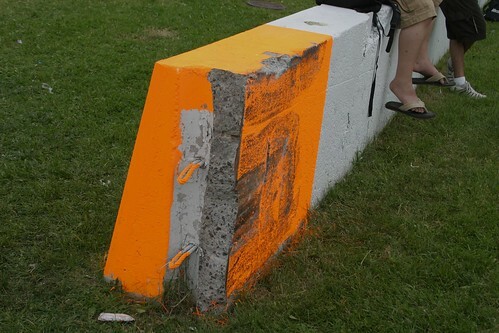 For F1 fans out there, you might remember the spectacular crash at the 2007 Grand Prix du Canada in Montreal where Robert Kubica hit an unprotected cement wall so hard that most people in the stands (I was there) thought he was certainly dead. After the race, I walked to the part of the track where the impact occurred to see what damage there was to the track and retaining walls. The first picture shown shows the primary impact point where most of the energy of the car, travelling at over 150 mph, was dissipated. 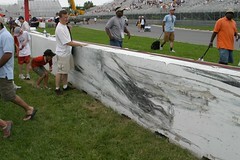 Check out the wall, the paint isn’t even missing! There are no dents or other damage you can see. Its time like then when you understand why concrete is used as a building material; the load it can handle under compression is incredible. The first impact point shows damage (see the fluorescent bit that is missing) but we looked at it for quite a while and our forensic skills could not determine if the damage was already there before the incident. 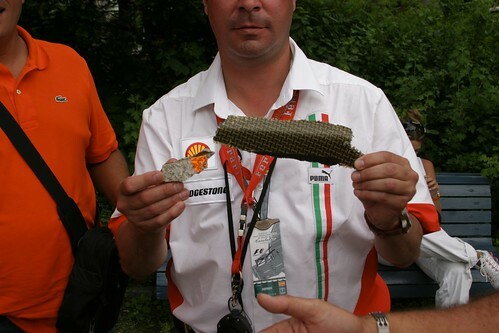 It was only later when I got a pic of a fan who had collected one of the pieces of concrete that had chipped off. Also missing were any large pieces of carbon fiber from the car, this was another item that people liked to take as a souvenir, even though they are dangerously sharp. 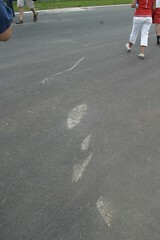 This first impact point was where the right tire and suspension was sheared from the car. The majority of the damage that was done to the track was actually done to the much softer tarmac, which is shown in the fourth picture. I have also attached a 3D computer animation that accurately reconstructs the crash.